(NEW YORK) — Ketamine is often used in hospitals as an anesthetic, but it’s also well known as a street drug. Now, an expert panel wants to convince the Food and Drug Administration that ketamine may help treat severe depression when no other drugs work. Tests for ketamine as a depression treatment began in the late 1990s, when psychiatrist Dr. Dennis Charney and a team of researchers saw that patients with severe depression, who were undergoing operations, were given ketamine and subsequently experienced fewer symptoms. The team quickly got to work on a study, which was published in 2000 and found similar results. The only problem with the study was that “no one cared,” Charney told ABC News. That was not the case for the next study on ketamine’s effects on people with depression, which was sponsored by the National Institute of Mental Health. After it showed that patients with major depression benefited from two ketamine treatments a week apart from each other, doctors who didn’t have anything else to offer patients with severe depression began treatment with the drug. Several other studies since then have also found success in treating depressed patients with ketamine. Most recently, Johnson & Johnson has developed a ketamine-based nasal spray called esketamine. 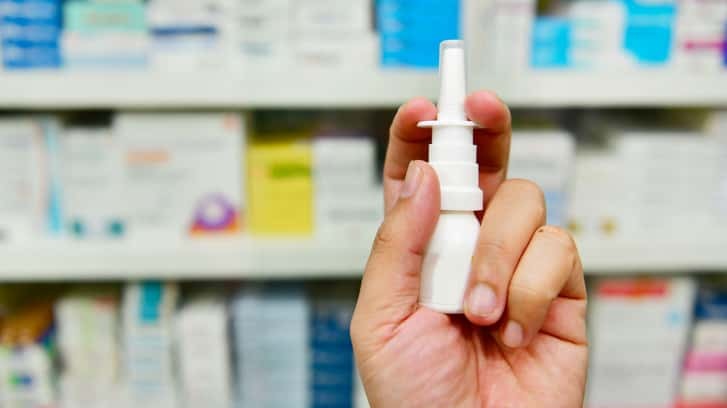 On Feb. 12, an advisory committee at the FDA voted in favor of approving the nasal spray, an action that the FDA will decide on by March 4. What is esketamine and what would it be used for? Esketamine is a nasal spray derived from ketamine, a medication most commonly used to put people to sleep during an operation. Ketamine has also been given off-label intravenously to people with severe depression for over a decade now. Both physicians and patients have reported rapid improvement in their depression symptoms, sometimes within hours of taking their first dose, Charney said. While Charney said it’s still unclear how the drug fights depression so well, he said it might involve restoring brain cell connections through totally different neurotransmitters than conventional antidepressants. Charney said that based on his study of ketamine, side effects are generally mild, with the most common ones being dizziness, increased blood pressure, sleepiness, and dissociative symptoms (feelings of being “detached” from one’s surroundings). If esketamine is approved, Charney said that a ketamine nasal spray would have to be administered in a doctor’s office so that patients could be monitored. Esketamine is currently undergoing human clinical trials, but preliminary data has been so promising that the FDA assembled that panel of experts to see if it should be made available to the public immediately. Dr. Charney is “very optimistic,” and that recent vote, 14 to 2 in favor, is also promising. They haven’t mentioned how much the treatment would cost, but if it’s FDA approved, it often means that insurance companies will begin to cover it. Ketamine is used for anesthesia, but it also has a reputation as a “club drug” that alters consciousness by distorting vision and sound as well as causing feelings of being detached from one’s environment. That said, there is currently no evidence that people can become addicted to treatment doses of ketamine, which are much lower than they would be for recreational or anesthetic use. The longest study on its effects against depression show that it can be taken safely for up to a year, however, that’s only because the drug hasn’t been studied for a longer period of time. Charney said that it’s possible the drug could be used for longer than a year, but that patients could probably be tapered off of it over time or use it as a “bridge” while waiting for more conventional antidepressants to work. It is unclear at this time if patients will require ongoing, lifelong treatment, he said. As a fierce supporter of using the drug’s in people with depression for almost 30 years, Charney is optimistic as he waits for the FDA to make a decision.